As you probably already know, traditional methods of refuse handling are quickly becoming cost prohibitive. Rising fuel rates and distances to acceptable disposal sites are causing waste hauling rates to increase at an alarming rate. Therefore companies must reduce these costs by disposing of more refuse per trip. Compaction systems provide the most effective method of reducing costs. A properly designed compaction system will reduce labor, eliminate pilferage and minimize hauling costs. 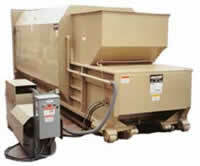 Compactors are used with almost all forms of waste and recyclables. American Compactor Equipment Sales offers Marathon compactors and balers, preventative maintenance programs and an on call repair department. ACES is proud to be Central California's only factory authorized distributor for Marathon Equipment. If your company generates 40 yards of trash per week or more, we can save you money! On average, compaction reduces a company's hauling costs by at least 75%. Copyright © 2007-10 - American Compactor Equipment Sales - All rights reserved.